— This article by Jerry Cates was first published on 23 October 2015, and revised last on 3 April 2016. © Budsinthenews Vol. 6:10(6). Bay (Laurus nobilis) is an aromatic evergreen tree with green, glossy leaves. It is a Mediterranean native, and one of several plants used for bay leaf seasoning in cooking. 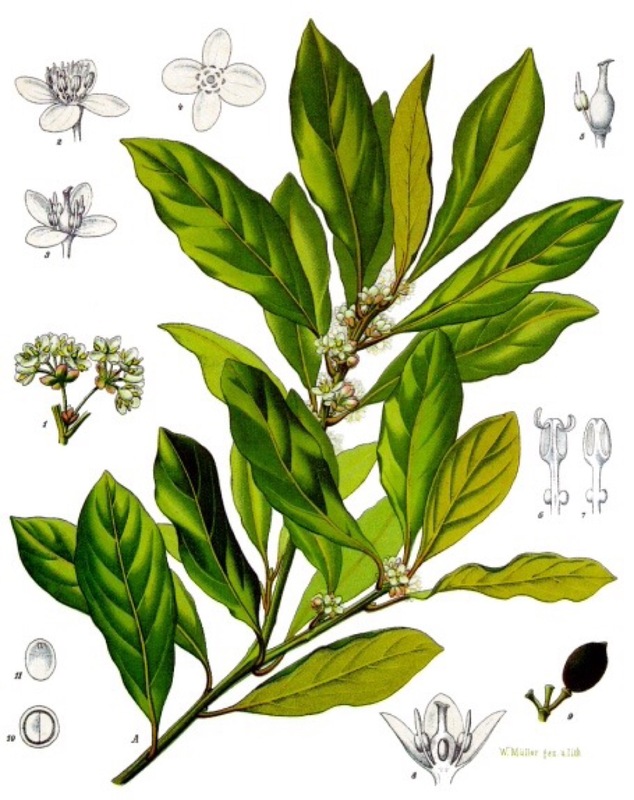 Known as bay, bay laurel, sweet bay, bay tree, true laurel, Grecian laurel, laurel tree or simply laurel, this tree figures prominently in classical literature. A large number of plants, from diverse botanical families, are erroneously referred to as bay or laurel. This conundrum is a result of a similarity in either foliage, aroma, or both to Laurus nobilis. The Bay tree reaches 10–18 meters (33–59 ft) in height. Being dioecious, individual trees have either male or female flowers, but not both. Flowers are yellowish-green, 1 cm diameter, and borne in pairs axially. Leaves are 6–12 cm long, 2–4 cm broad, with entire (untoothed) margins that sometimes undulate in the primary plane of the leaf. Fruits contain a single seed, and are small, shiny black berry-like drupes about 1 cm in length. Prior to the Pliocene era, during which era the Mediterranean began to dry, the region was much more humid. The huge laurel forests that originally covered much of the Mediterranean Basin were forced to gradually retreat. They were then slowly replaced by the drought-tolerant sclerophyll plant communities that dominate the region today. Most of the ancient laurel forests around the Mediterranean died out about ten thousand years ago. Remnants of these forests persist in the mountains of southern Turkey, northern Syria, southern Spain, north-central Portugal, northern Morocco, the Canary Islands and in Madeira. Bay is often planted as an ornamental. The author has found numerous specimens planted in central Texas for this purpose. In a few cases, the trees appear to have developed from seeds dropped by birds or other animals, as the landowners have no recollection of planting the trees, or remember seeing the sprouts, and decided to let them develop. Essential oils of the bay tree are derived from leaves and berries, and are comprised of some eleven distinct groups of chemicals. The primary constituent is eucalyptol (1,8-cineole; which is also found in camphor laurel, tea tree [5-15%], mugwort, sweet basil, wormwood, rosemary [35-45%], common sage, and a number of other aromatic plants). The fruit contains up to 30% fatty oils and about 1% essential oils; these essential oils consist of terpenes, sesquiterpenes, alcohols, and ketones. About 1.3% of leaf mass is essential oil, of which 45% is eucalyptol, 12% consists of other terpenes, 8-12% is terpinyl acetate, 3–4% is a variety of sesquiterpenes, 3% is methyleugenol (compare the 80–90% eugenol fraction found in clove bud oil and the 82–88% eugenol fraction found in clove leaf oil), and the remainder consists of other α- and β-pinenes, phellandrene, linalool, geraniol, terpineol, and lauric acid. The author purchases bay in bulk for use as important ingredients in the manufacture of proprietary habitat modifying herbal cleansers. —Feel free to e-mail jerry.cates@budsinthenews.info regarding your comments on this article. You may also register, log in, and leave a detailed comment in the space provided below.